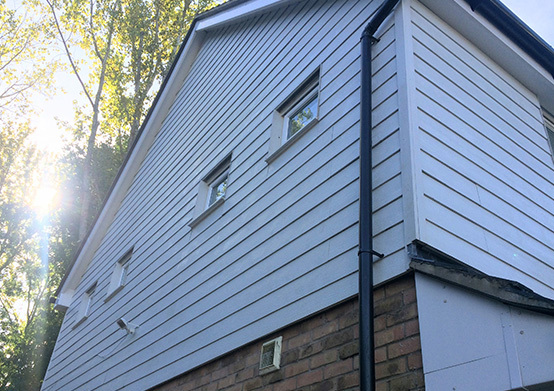 We’ll have your cladding looking clean once again! Over time your cladding accumulates dirt, often left from rain which dissolves dirt, then runs down your cladding, leaving it looking green with the growth of algae, or black. This makes your house looking very dirty and unattractive. We use a special detergent which lifts dirt and grime, leaving your cladding looking clean and gleaming again the way that it used to. 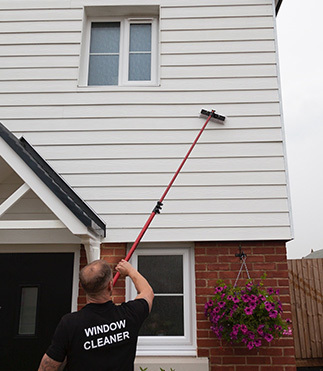 Once we give your cladding a pre-spray with a special detergent, we then proceed to clean the cladding so that it is free from all dirt, grime and algae. We use telescopic poles, with a specifically designed brush, that has long bristles to agitate the dirt and remove it. Once the cladding is cleaned we then rinse your cladding with pure water, this makes the cladding clean and is left gleaming once again. On completion of the service we then give the cladding a final inspection. It is at this point, once we are happy with the standard of the clean that we are able to give you our satisfaction guarantee. Recommendation – once a year – ask about our regular cleaning schedule.